MIM Corporation, a pharmacy-related healthcare solutions company, looked for a unique solution and found it on this annual report. 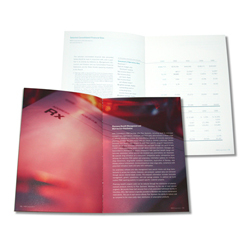 Working with Curran & Connors, Kat Georges Design created stunning layouts for financial data, in a unique 6 by 9 inch format. The information was presented in a clear, concise layout, with illustrative and typographic nuances that made it really shine.